As a master colorist and designer for more than twenty years, Deborah combines the most current cutting, color and perming techniques to help clients achieve a total look. She believes that ongoing education is a vital ingredient to her success, and she constantly expands her technical knowledge with information on the most progressive salon treatments. 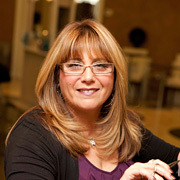 She recently developed specialized skills in dealing with hair loss in men and women, including coloring on natural hairpieces and the latest treatments.